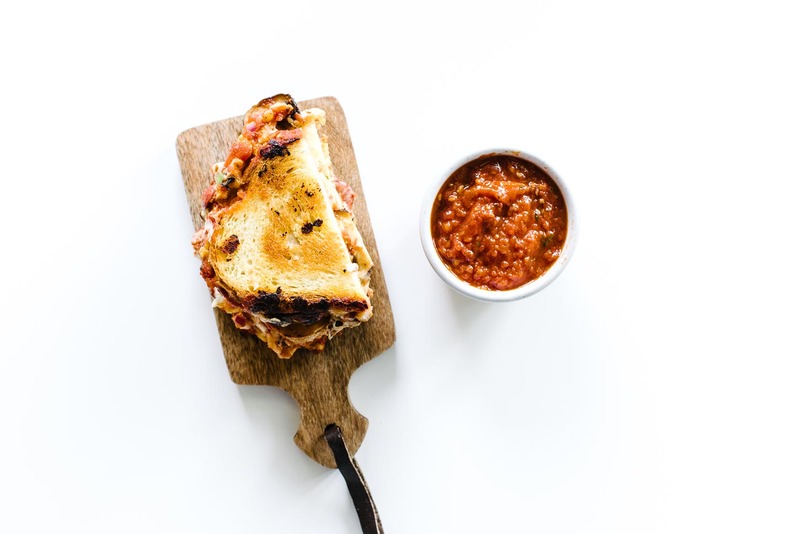 Pizza grilled cheese: perfect for those times when a pizza craving hits but you're too hangry to wait the 30-40 minutes for delivery! Do you guys ever get a craving for pizza but the 30 minutes it takes for delivery to arrive just seems way too long? I have the answer, my friends! Pizza grilled cheese! All the goodness of pizza, minus the pizza crust because who has pizza crust just hanging out in the fridge at home? Oh wait, you do? Can we be friends?! Okay, now that we’re friends, you can make me this grilled cheese! 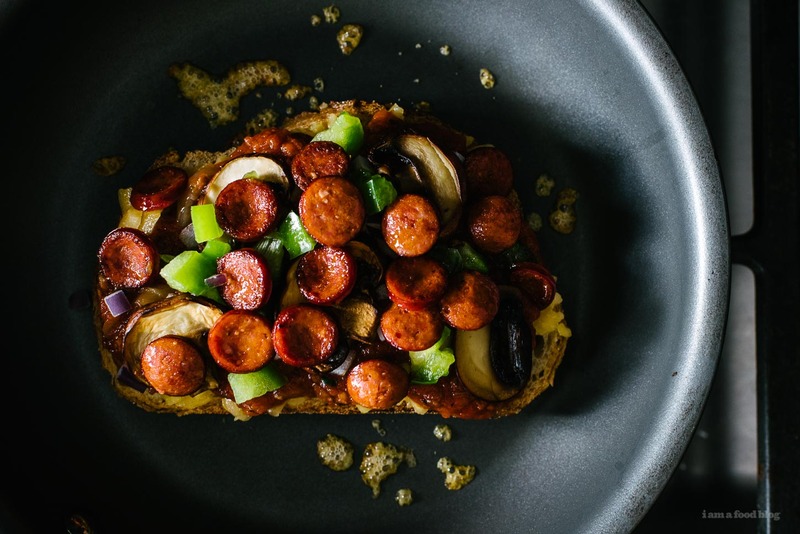 All we need is bread (duh! ), cheese, pizza sauce, and toppings. I used mini mini pepperonis because mini pepperonis are cute AF. 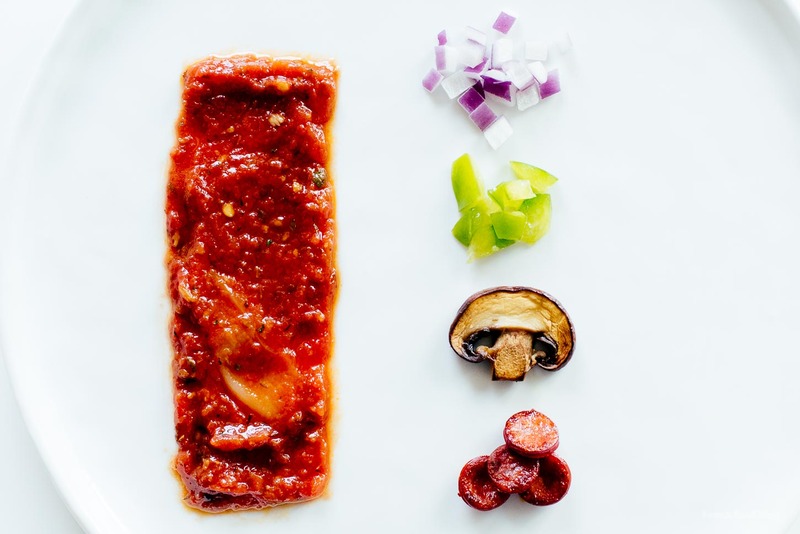 I also added everything in a classic deluxe: red onions, green peppers, and mushrooms. After you gather your ingredients, it’s just a question of buttering the outside of your bread and building. I like the double cheese strategy – that is, cheese on both slices of bread so that it can hold the insides together. I also like using shredded cheese because it melts faster and because it’s stringier. Don’t quote me on that one though because I haven’t scientifically figured out if shredded cheese is meltier and stringier than sliced. Wait, no I have thanks to google. Grated cheese is meltier than non-grated. To be honest, it doesn’t matter what kind of cheese you use as long as you’re using a good melting cheese because the best part of grilled cheese is the gooeyness of the cheese pull. Melting cheese slowly prevents the fat from separating out. You want a nice, even, homogenous melting cheese, like mozzarella, Taleggio, brie, Gruyère, Emmental, and Pepper Jack. Also, pro tip – when you’re making grilled cheeses, low and slow is the way to go. 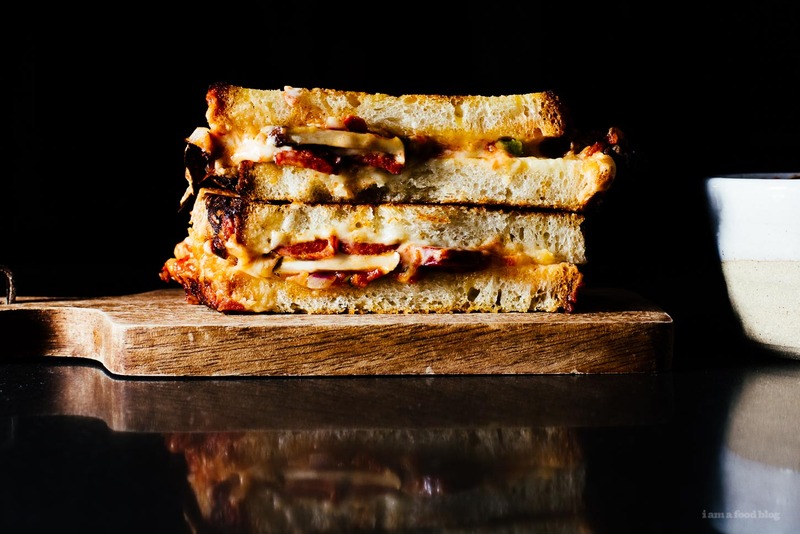 But, not too slow, this grilled cheese will assuredly be in your mouth way faster than ordering a pizza. So, what are you waiting for? Go forth and grill cheese! Build your sandwich, buttered bread facing outwards: bread, cheese, pizza sauce, toppings, cheese, bread. Place in a heavy bottomed pan and grill on medium low until golden brown and toasty and cheese is melted, flipping once. The first side will take a bit longer to toast than the second side. Enjoy!